First things first: I would like to give Gina the credit for the chemo cap idea. Her husband and Jason are doctors at the same hospital, and at one of our KnitSmiths meetings she suggested that we should make caps for the kids who have lost their hair because of chemo. I made the first one out of Berrocco's Chinchilla, and I used this pattern from headhuggers.org, which is a site dedicated to facilitating chemo caps for cancer patients. 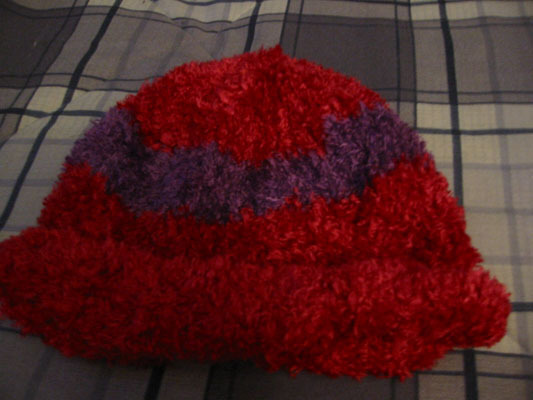 This cap was for a seven-year-old girl, and unfortunately all of their patterns for children are crocheted. I adjusted the pattern by using smaller needles and I reducing the number of stitches that I cast on to about 3/5ths of what is called for in the pattern. It was too small to fit onto my big head, so I took that to be a good sign. Jason said it fit her well and that she loved the softness and color of it. The second one was for a little four-year-old boy, and I made it out of Lion Brand's ridiculously soft Microspun on size 6 needles. 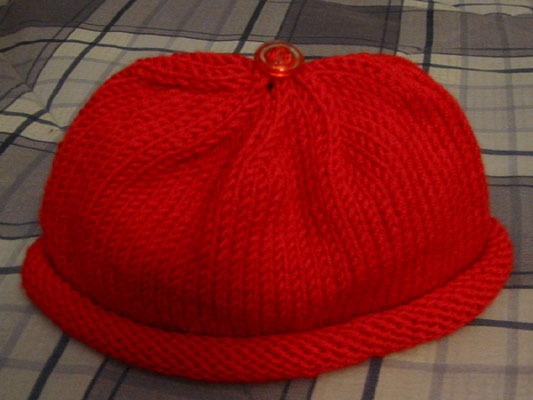 Just ask the Knitsmiths, I cast on for this hat and ripped it out several times because I kept making it too damn big. I finally got it right at 84 stitches. When I finished it, I thought it looked cute but a little plain. Way back when I started the Waikiki tank, I was using a pattern that called for a button closure on the halter. Since I ended up using a totally different pattern, I had this cute little button left over and it just happened to match (it has a red circular pattern that you can't see very well here). Perfect! According to Jason, it was also well received by the parents -- less so by the little guy, who was in a grumpy mood. Understandable, considering. Thanks for the credit! But you guys have actually followed through on my erratic ideas. Now I have to actually put my hands where my mouth is. They look great! That Chinchilla one must have been so soft. And I love the button on the red one. Terrific idea! I'll have another one finished tomorrow. Are you working on more or are you back to Lindsay? Those are so cute! And that Microspun was really soft! I hope you are feeling a little more like yourself and not so under the weather after doing such a nice thing for children who need a nice pick me up in their day.